On my personal Facebook page for the past 12 days I posted my favorite photo I took each month during 2013. For those who saw that, here's a recap. For those that didn't, here they are. And this site also has its own Facebook page and you can "like" us here. 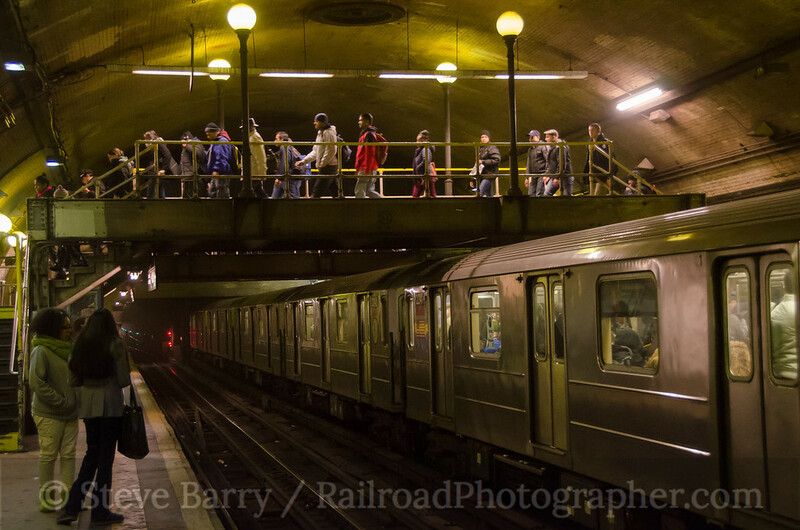 We start off with a shot from January 29 on the New York City subway system. Near the north end of Manhattan on the 1-Line are three of the deepest stations on the system, located in the Washington Heights Mine Tunnel. The middle of those three stations is 168th Street which, with its arched ceiling, is considered to be the most architecturally interesting station open to the public (City Hall station, now closed, is certainly tops on the list of architectural interest). February saw a trip to sunny Florida, where a visit to the Orange Blossom Cannonball at Tavares was in order (covered in a post here). 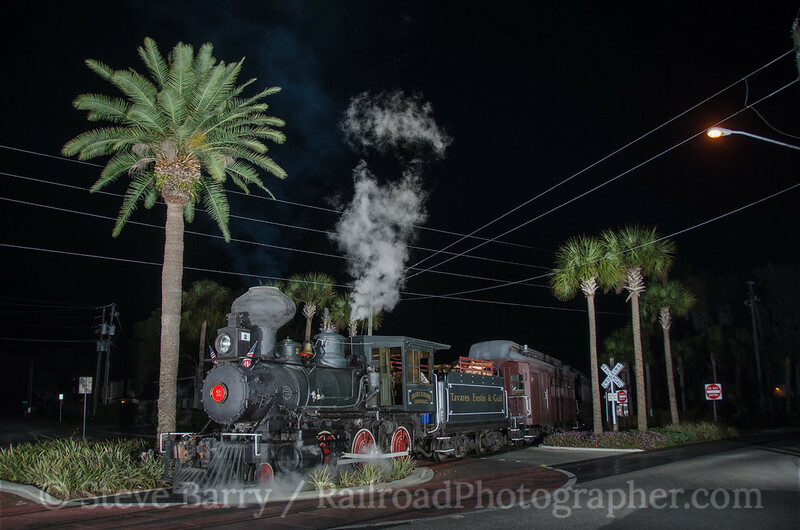 After a day of shooting the wood-burning steam locomotive, we did three night photo setups, including this one where we briefly blocked traffic at a rotary near the Tavares depot. In March it was off to California for Winterail, the big railroad photography exhibition in Stockton. 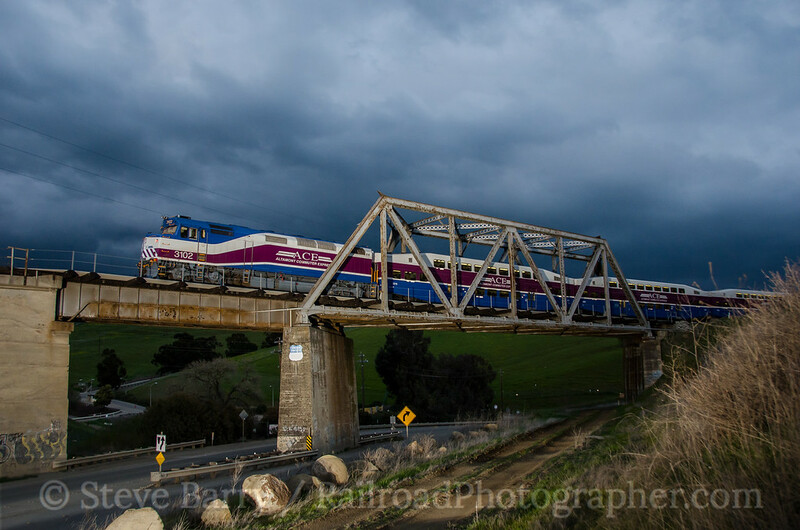 On the way there from San Francisco I traveled over Altamont Pass and shot the Altamont Commuter Express with its locomotive in "push" mode heading from San Jose to Stockton. The sun had just set, and a set of strobes were used to provide a hint of fill lighting. The train is on the former Western Pacific; the Southern Pacific also crossed Altamont Pass, but the dirt trail under the bridge is all that remains of the Espee. A weeklong trip that included visiting Cincinnati and Chicago also resulted in backtracking to the Pocahontas coal fields in between the two cities. Norfolk Southern's heritage units (locomotives painted in classic schemes of the predecessor roads of NS) had been assigned there, and two were found pushing a train up the grade from the coal fields of West Virginia into Bluefield. The colorful unit is painted in the scheme of the original Norfolk Southern, a small railroad that operated in Virginia. The blue unit is painted for the Norfolk & Western, one of the largest railroads to be merged into Norfolk Southern 30 years ago. While I hadn't chased a main line steam trip in several years (preferring photo charters instead), I got out and chased Nickel Plate Road 2-8-4 No. 765 when it made its runs over the former Pennsylvania Railroad on Memorial Day weekend (covered in a post here). The trips ran from Enola Yard near Harrisburg to Altoona and beyond, traversing famous Horseshoe Curve before turning back east. Just beyond Horseshoe Curve on the climb up the Allegheny Mountains is MG Tower that once controlled movements along the line. MG is long closed, but the tower still stands, and getting 765 passing there would be perfect. It's a mile and a half hike uphill to the tower, but it was worth it to getting two icons of railroading together. 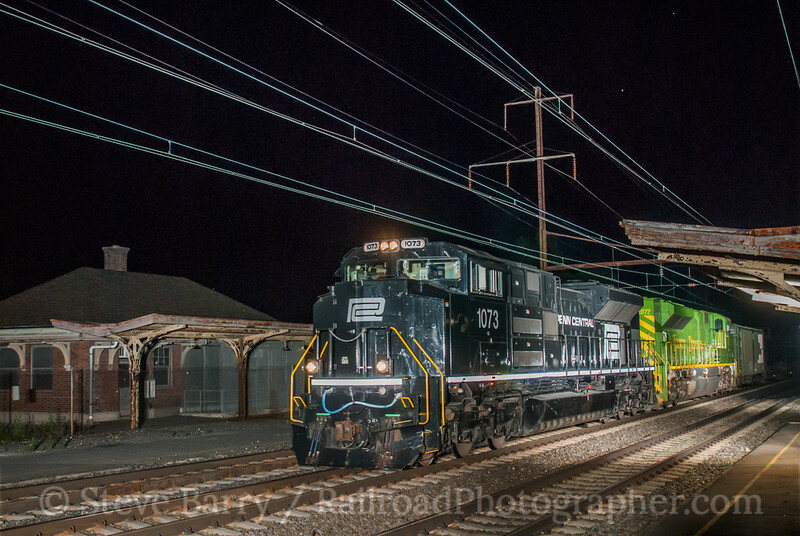 By the way, two more of Norfolk Southern's heritage units are trailing 765 -- one painted for the Pennsylvania Railroad and the other for Conrail, two of the railroads that at one time called Horseshoe Curve home. The month of June was a stay-near-home month, other than a quick trip to Ottawa that didn't see a lot of photography. Towards the end of the month, two more of the Norfolk Southern heritage units headed my direction, this time one painted for Penn Central and the other painted for Illinois Terminal. The pair were leading an oil train from Harrisburg down the Port Road to Perryville, Md., then over Amtrak's Northeast Corridor to Newark, Del., before diverting to the refinery. I set up on Amtrak at the abandoned station at Elkton, Md., at around 8:00 p.m. I then heard from a friend that the train had hit a downed tree on the Port Road and was delayed. 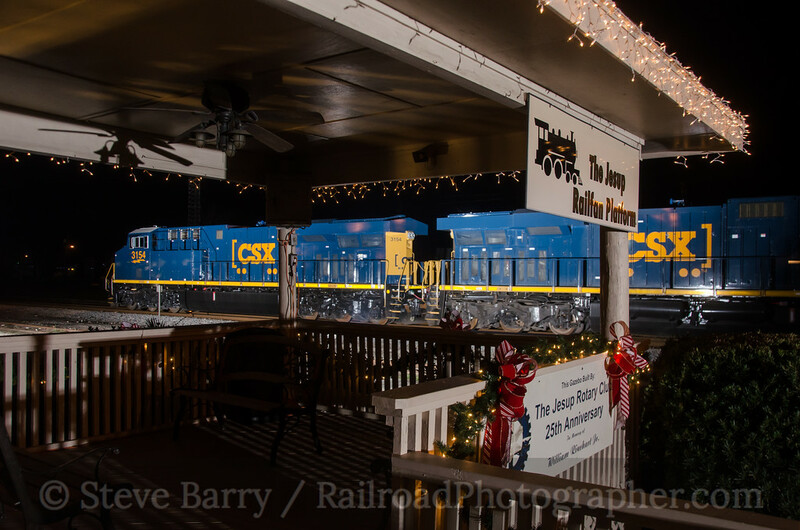 Finally, just past midnight, the two came through Elkton. July started off with a trip to Ohio to celebrate the 50th anniversary of the Cedar Point & Lake Erie Railroad at the famous roller coaster park near Sandusky. 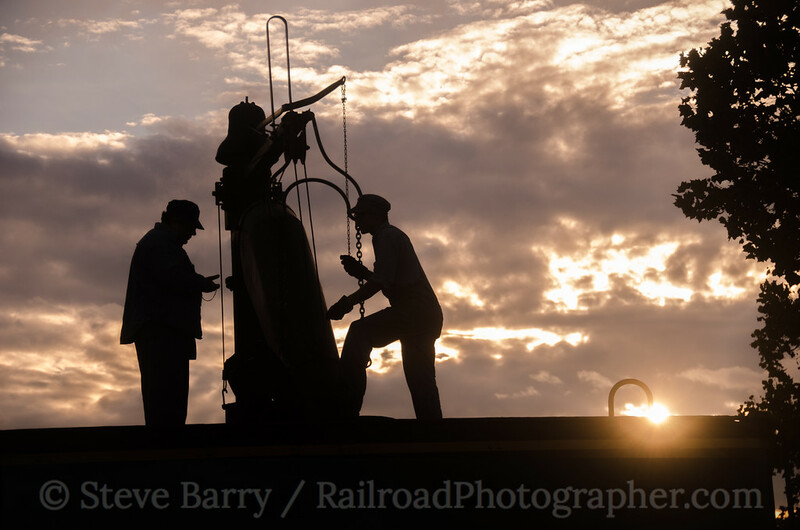 Shortly after that I headed for Roanoke, Va., for a photo shoot at the Virginia Museum of Transportation hosted by Lerro Productions (and covered in this post). 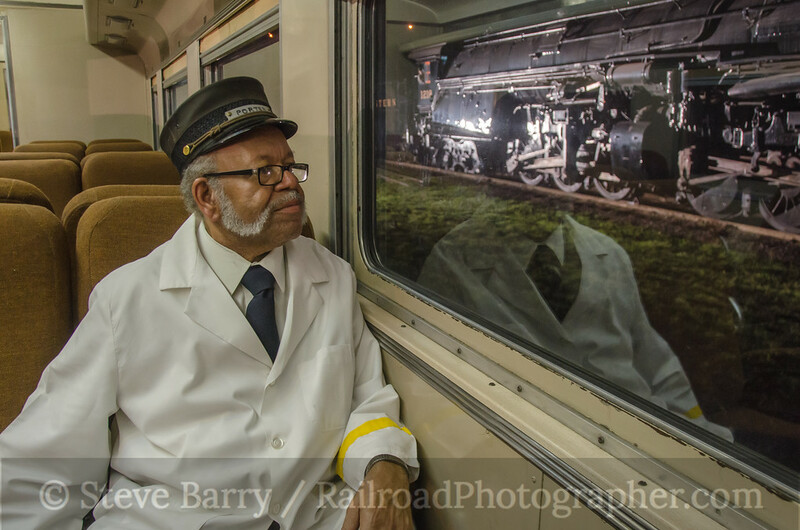 From that session my favorite photo is of museum volunteer Charles Hardy dressed as a Pullman porter, looking out the coach window at Norfolk & Western 2-6-6-4 No. 1218. August saw not one, but two trips to Ohio -- one for Summerail, a photography exhibition in Cincinnati, and the other back to Cedar Point for more steam and roller coasters -- but the highlight of the month was a trip to the Canadian prairies of Saskatchewan and Manitoba. 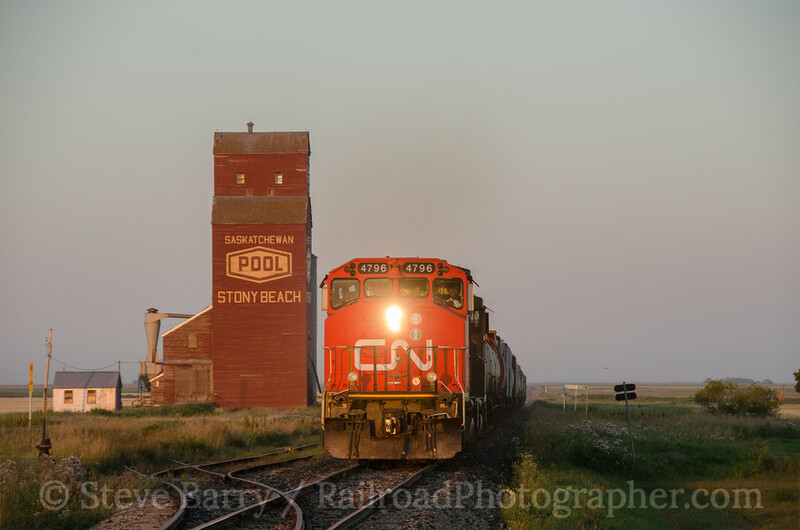 Getting this shot of a Canadian National train passing the classic Saskatchewan Wheat Pool elevator at Stony Beach took some persistence (see the entire story behind the shot here), but it became one of my favorite photos of the entire year. No sooner was I back from Saskatchewan than I was back on a plane again, this time heading to Alaska for the convention of the National Railway Historical Society. 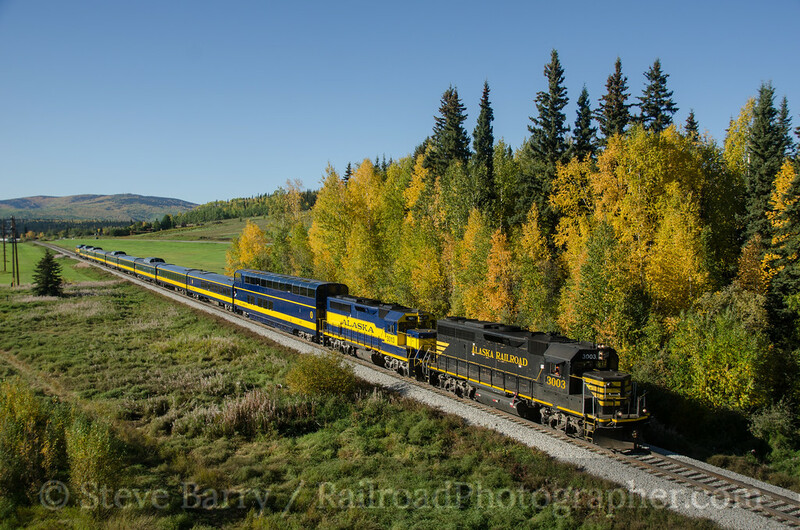 The convention began in Fairbanks, where I shot a passenger train jointly operated by the NRHS and Alaska Railroad passing a splash of fall color on the outskirts of town. The NRHS had arranged for a locomotive painted in the old black Alaska Railroad scheme to lead the train. With two huge trips behind me, early October was spent close to home looking for fall colors. 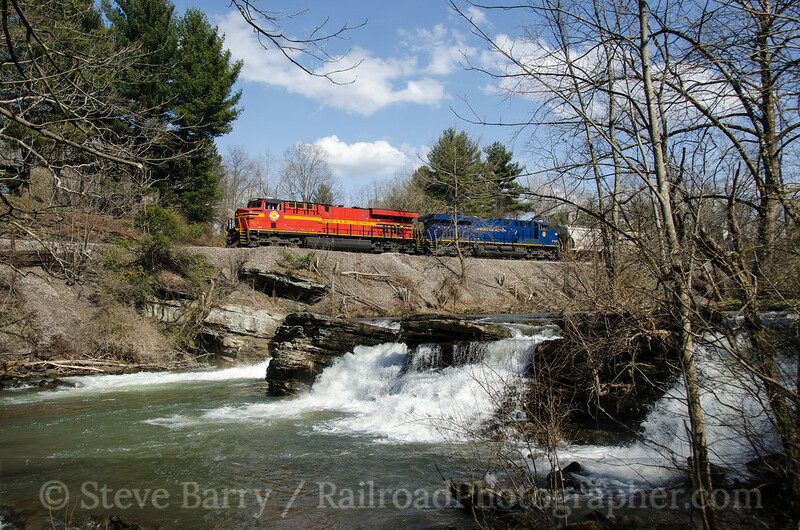 Later in the month I headed to Cumberland, Md., for two days of photo charters hosted by Lerro Productions on the Western Maryland Scenic Railroad. 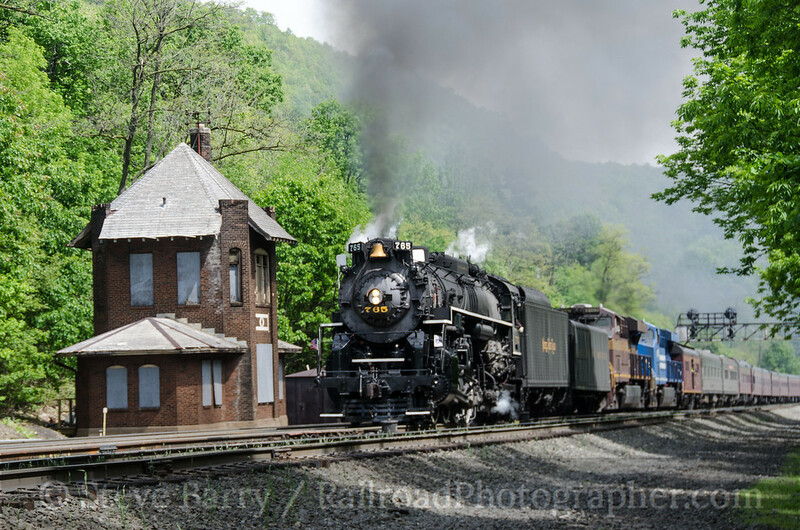 The trips included sunset and night photos, as well as plenty of action in daylight, but my favorite shot came just after sunrise on the second day as Western Maryland Scenic 2-8-0 No. 734 (renumbered to 729 for the charter) took water from the spout in downtown Cumberland. With the days getting shorter and cooler, November was another month with no long-ish distance travel. Throughout the fall I had been shooting at various locations on Metro North in New York and Connecticut (and presented many of those photos here). The evening of November 23 was a bit overcast, but the air at ground level was clear with no city haze. I spent the cool evening at Dobbs Ferry, N.Y., which provides a nice view looking down the Hudson at New York City. 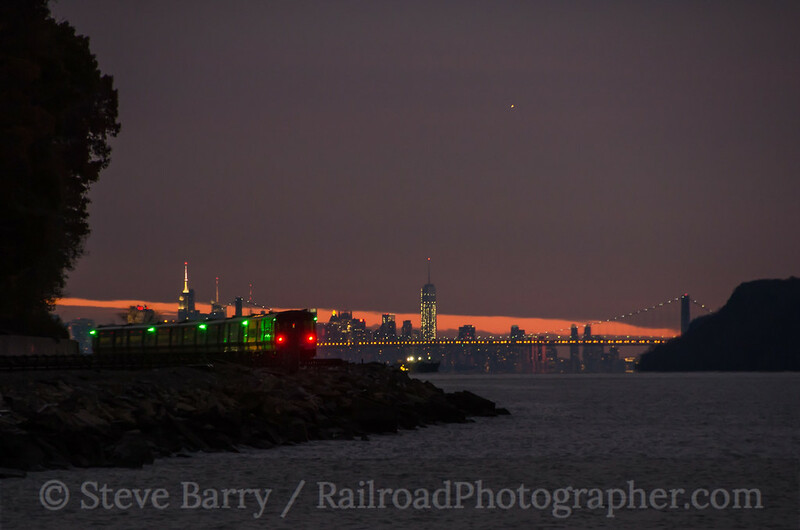 As the sun set, I shot many different trains under different lighting conditions, but my favorite was this scene of an electric multiple unit train heading towards the Big Apple as the last bit of orange peeked under the cloud cover. I returned to Florida in December, driving one way and flying back. During the drive down I spent an evening in Jesup, Ga. (covered in this post) shooting Amtrak and CSX trains after dark. My favorite shot from that trip was taken in Jesup, but it wasn't even a shot I had set up for. I was set up for a southbound train to come through town, passing the railfan platform where folks can watch trains. However, before the southbound got to Jesup a northbound was given clearance on the single track through town. Knowing the southbound would be through shortly after the northbound, I knew I wouldn't have time to reposition my strobes between trains. I thus settled for this going away shot of the northbound, using the same light set-up as I would use for the shot I really wanted of the southbound. As it turns out, the shot I "settled" for I wound up liking better than the shot I was after! Not a bad way to wrap up a busy year!